My 13 year old grand-daughter, Vivian, was spending the night with me last weekend and since her two brothers were also, a slight sleeping problem arose. Which one of them was going to have to spend a night sleeping on the floor? Well, the second night the lot fell to Vivian. She was convinced that a spider was out to get her and was sure if she could sleep up higher none would be able to reach her. All my reasoning that spiders could climb up or on anything or anywhere didn’t convince her. She was sure a spider was lurking right nearby her, just because she was sleeping on the floor. So, to ease her mind I decided to tell her about the Happy Face Spider and said if any spider was around in my house it was probably a Happy Face who wouldn’t harm her, but might decide to tickle her to make her laugh. 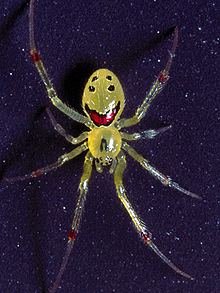 When you see a picture of a Happy Face Spider you just can’t help but smile and be amazed at God’s handiwork. This spider has markings on its abdomen that look just like a smiling face. Not a lot of information can be found on Happy Face Spiders, however I will include a couple of interesting links you might want to check out for further information. common black spider lurking in the corner of the room, perhaps just waiting for his chance to pounce on her when the lights went out. Go figure! I’m not a big fan of spiders,, but if I met a Happy Face Spider, I’d be even more freaked out by it’s sinister abdomen smiling at me. It looks like “The Joker” from the old Batman tv series. Spooky.